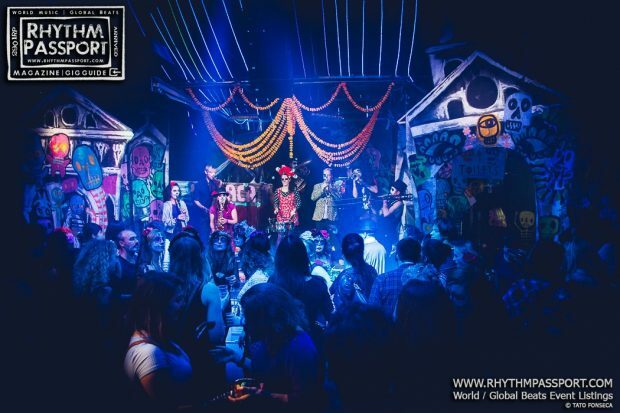 If you like your cumbia, mambo, afrobeat, blues and funk in a big brass band style, then tonight at Rich Mix you were in for a big happy, vibesy, energetic treat. 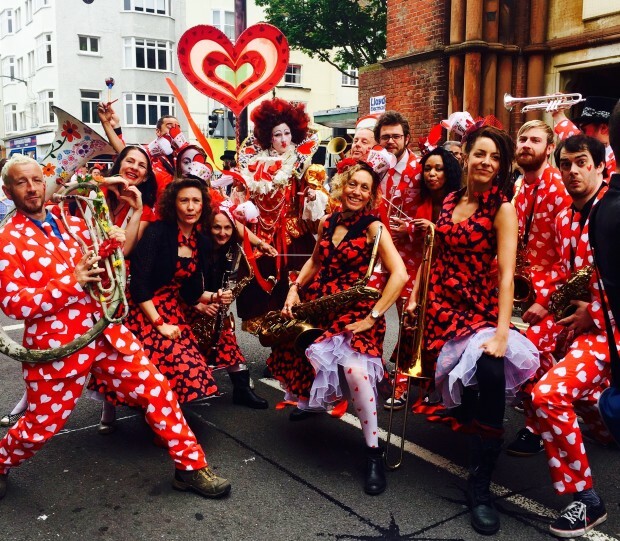 Voodoo Love Orchestra were kicking off their new album, Inglorious Technicolor, tour, bringing the full power of their brassed-up sound, complete with lunges and jazz hands! The Brighton troubadours enter the stage which is creaking with all twelve members, who are raring to entertain an eager audience. The crowd are lapping up their interpretations of classic tracks filtered through a lens of funk, big band swing, Jamaican ska and Colombian cumbia, as shown in their cover of ‘Fever‘, which is given a swinging cumbia style makeover. Inglorious Technicolor by Voodoo Love Orchestra Now that the audience has hit fever pitch, the band relax into playing some tracks from their new album such as ‘A La Memoria del Muerto‘ and ‘Ghost Town‘, which get the crowd jumping around and lift the energy levels even higher. After brewing up a storm this summer at festivals such as Shambala and Tropical Pressure, the 12-piece outfit are masters at getting the crowd involved. First we have a bit of lunging to stretch those dancing legs, then we have a bit of Jazz hand action, before finally getting the whole audience to perform a conga with band members. The battles between the wind and the brass section on stage are lung-bustingly loud and fun, which seems to be the order of the evening for Voodoo Love, and that fun energy transmits to the crowd. Rolling through tracks such as their versions of ‘Plinio Guzman’, ‘Frankenstein Ska’, ‘La Piojasa’ from their new album, you get the sense that these guys could play all night. A great version of Ebo Taylor’s ‘Love and Death’ really allows the brass section to show off their skills, and is a change in sound from the cumbia, ska, mambo-laden night so far. Inglorious Technicolor by Voodoo Love Orchestra When they announce the last track, the crowd are wanting more and a return with a storming version of Fela Kuti’s ‘Zombie’ lifts the roof. Then to bring the show to a close, the whole band moves into the audience and plays a track off their new album ‘La Samaria’, leading the audience on a little parade before they all sit down on the floor with their audience to pound out the finish. Album launch nights are not always as much fun as this, and credit to Voodoo Love for bringing great music, energy and fun to Rich Mix tonight to kick their new album tour off in style.